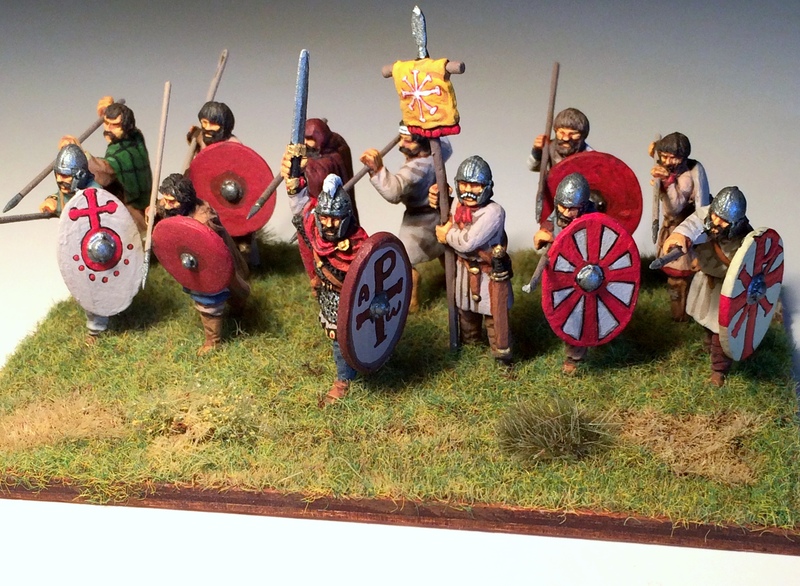 Here is the third post in the series (Following Part 1 and Part 2 ) as I slowly build my Romano-British army for Dux Bellorum. This time, I’ve got the infantry to show. 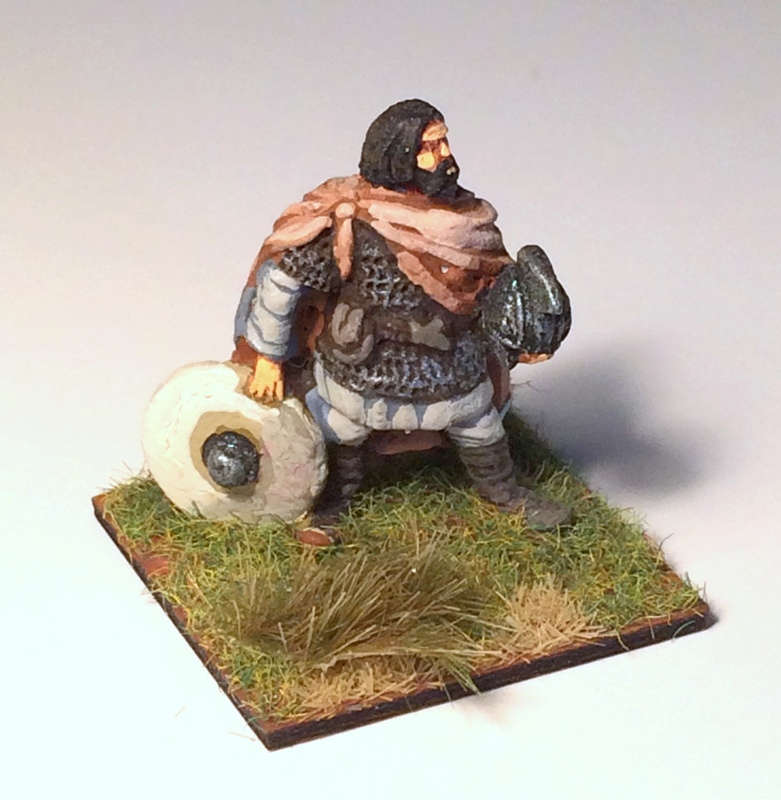 First up are the “ordinary shieldwall” units. I like using the 120mm x 80mm bases for this because I don’t need to worry about swords and spearpoints getting snapped off during a game because they don’t extend beyond the front edge of the stand. This also makes it easier to store them as well. As you can see, the ordinary shieldwall as not particularly well armored, and I used a mix of troops in order to give an irregular look. These guys are definitely not regulars. They’re farmers and fishermen with whatever armor and weapons they can find, kept together by a few junior officers. Next up is a unit of “noble shieldwall”. These men have much better armor than the other men, but their role is the same. These men group together with the rest of the shieldwall to form an unbreakable defense line (or so it’s hoped). These are the anvil while the cavalry shown in the earlier posts are the hammer. 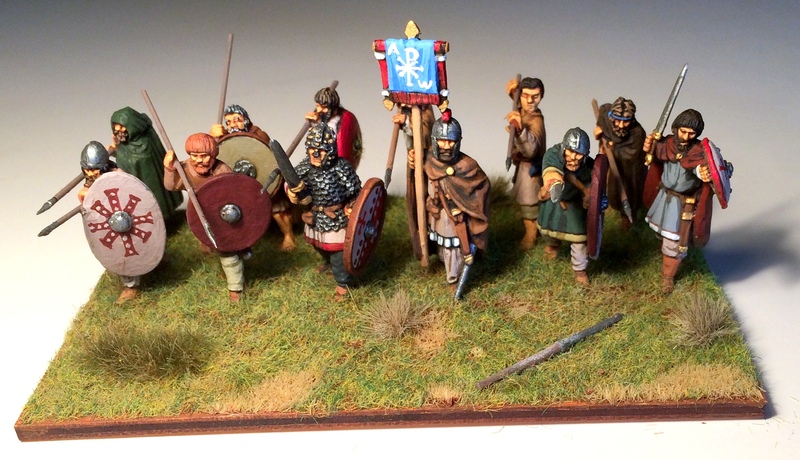 This basically completes the Romano-British army, at least enough to play a game. It’s a small army, with only three cavalry, including the commander’s unit, and 4 infantry. I have enough points to add another unit or some skirmishers, but these points can also be used to “buy” some of the special strategies in a game. Eventually, I plan to expand the armies I build so that I can use them with other rules such as Hail Caesar and Impetus. In addition to the actual units, I’ve also created some markers for the game. Rather than using dice or poker chips, I like to use markers that look like they are organic to the action. 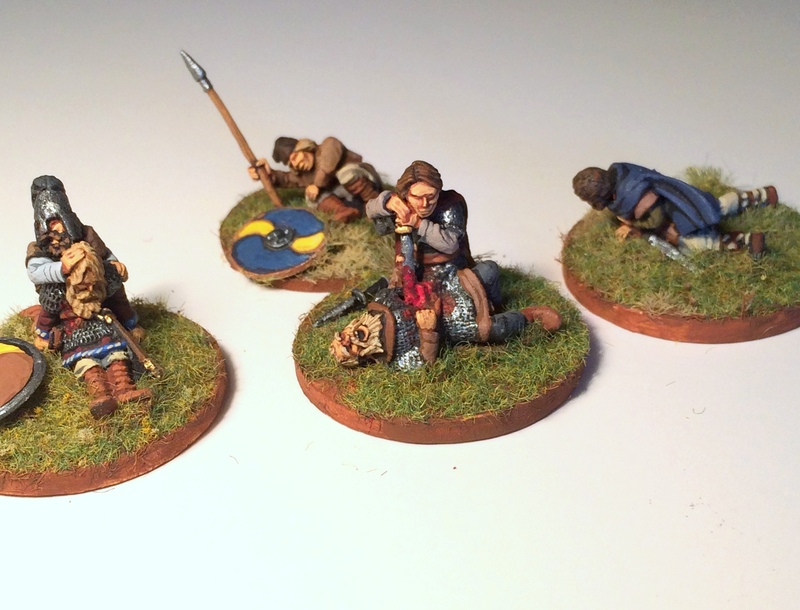 So, the first shot here is of some Saxon casualties (To go with the upcoming Saxon army) used to mark hits on a unit. These are from a pack of Old Glory casualties from the “Somerled the Viking Slayer” range. They’re really supposed to represent a later period than what I’m working with, so I made some minor conversions to let them fit in a little more. I changed some of the helmet types as well as a couple of head swaps. You get 20 casualties in a bag for a low price, and they are not bad sculpts at all, so it’s a pretty good deal. Last up is what I’m using to represent Leadership Points (LPs). Basically, I’m using command figures, but I differentiate them from the casualties by putting them on square bases. So, for example, if you see an enemy unit with three figures standing next to it, that unit has 3 LPs. This figure is from West Wind. I need 6-9 markers for each army, so I’m going to also use the Musketeer Miniatures Arthurian character figures for this. The bonus to this method is that I can simply use them as command figures if I play another set of rules. I’m all about flexibility! 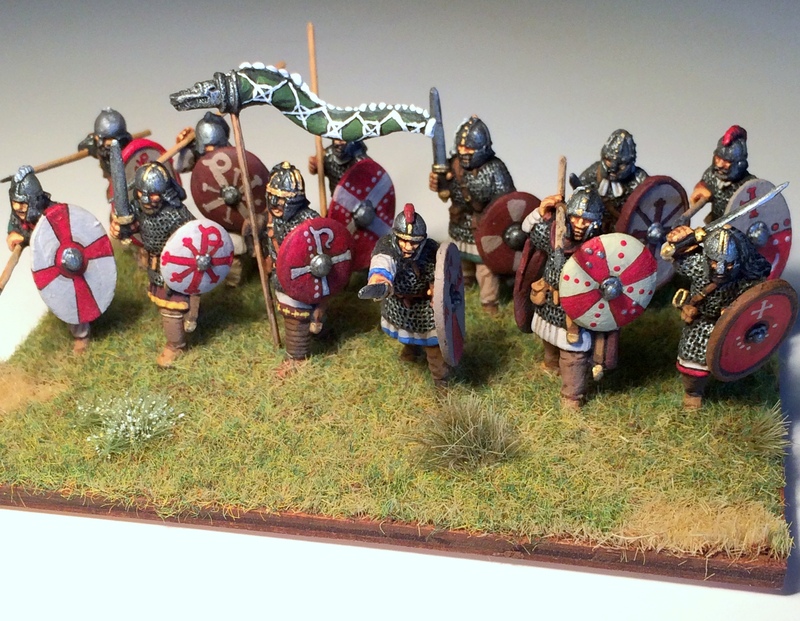 The next army in this series will be the Saxons. 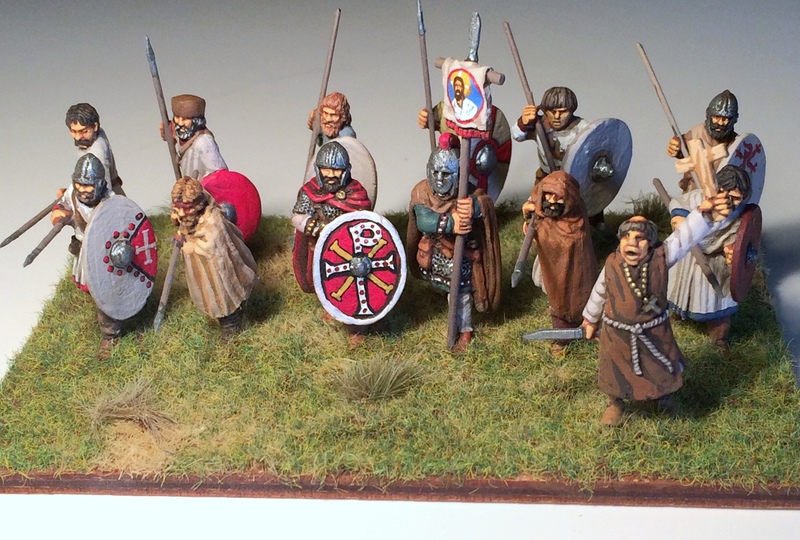 I’ve already finished some of the Saxon army, so hopefully I’ll post those shots next month. See ya then!